Best Online Eyeglasses Stores 2018 | Your Eyes Deserve The Best! Whether you wear eyeglasses as a necessity or as a fashion statement, choosing the right pair is just getting easier. Since the first online eyeglass store appeared in 2011, the playing field has grown, offering cool features and amazing prices, like virtual try-ons, $7 glasses (oh yeah! ), and measuring pupillary distance (PD – you need this). Some statistics point out that 75% of all adult Americans use some form of vision correction, whether it’s prescription-based, reading only, contacts or sunglasses. We’ve done some legwork on the best online glasses stores for you. So read on and make sure your prescription is current! Buying eyeglasses online today is almost as easy as walking into a brick and mortar store, although you still need a prescription for both. The major difference is trying on the glasses. Just like clothing, this is one issue that most customers have when it comes to buying online. But no worries! Virtual try-ons are actually a thing now, and are part of every e-commerce eyeglass store! Most of the online glasses stores provide the opportunity to virtually try-on a pair of glasses. The process is pretty easy - upload your photo or use your webcam, then answer a few questions, and the software will then select frames for you. This can be done sitting in front of your laptop or from your smartphone. Of course, the best way to see how the glasses look on you is to physically try them on. Some websites will allow you to choose frames, and they'll send them to you and you can either make a purchase or send them back - free of charge! Just check how long you can keep them. Each company has a deadline and if you keep them too long, your credit card will be charged for each pair. Eyeglass prescriptions involve a lot of numbers, optical terms and abbreviations - OD, OS, OU, sphere, cylinder, pupillary distance, axis, and many others. Your eye doctor can explain them to you, but it’s best to get a copy of the actual prescription. They are required by the federal law to do so, after all. You are not required to buy eyeglasses from them nor can they charge you money for the prescription. 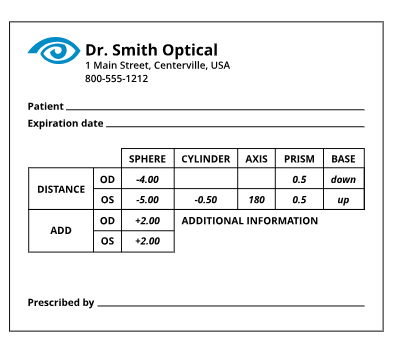 Some online eyeglasses stores require you to fill in the medical terms on their blank online order form. This may be a less accurate way to inform them of your prescription- one wrong + or - sign and you can potentially get a pair of nearsighted specs when you’re farsighted! Others allow you to upload an image of your prescription and email it to them- a far better method, in our opinion. For some people, eyeglasses are just eyeglasses. They stick to one frame style and color forever. For others, eyeglasses are an important part of their identify. Creative types will most likely have a “wardrobe” of specs to make a fashion statement. Online eyelasses stores need to stay on top of fashion and design trends to compete for customers. So if having a designer logo on your glasses is important, look for stores that stock them - not all do. Lifestyle also dictates our choice of eyeglasses. Do you sit in front of a computer all day? You might be a candidate for blue-light blocking glasses to combat digital eye strain. Are you a weekend warrior that hikes or bikes with friends? Maybe wrap-around prescription sunglasses with polarization and shatter-resistance are needed. Do you have young kids and teens that outgrow their glasses every year? Just be aware that not all online glasses stores offer these options. Let’s deal with dollars first. The online prices range from $6 to $99+ for a pair of eyeglasses. That’s a huge difference. Obviously, the quality and choice of frames and lenses come into play. However, there are many tempting deals and bargains that online eyeglasses stores offer- BOGO (buy one, get one), coupon discounts, refer-a-friend and loyalty programs, and don’t forget sale items! It’s also best to check with your insurance carrier about your vision coverage. Purchases from the online eyeglass store might not be covered, plus, insurance coverage changes all the time. In the end, it’s always good practice to get a detailed invoice if you have to submit your own claim. What happens if the eyeglasses shipped to you are not right They don’t fit. The lenses are off. You just plain don’t like them. Some online glasses stores offer 100% refund, no questions asked. Others will give you a discount if there is a manufacturing problem, issue store credit for the full amount you paid and even offer a one year, no-scratch guarantee. Accidents, negligence or improper care, as expected, would not be part of any warranty program. In my opinion, warranty equals replacement of defective merchandise only. Most online eyeglass stores have this policy in place- if it's broken straight from the box, then they'll replace it without any question. But if it's a user-caused damaged, then you may not have any other choice but to have it repaired or replaced out-of-pocket. Shipping charges vary from free ground shipping (longer wait) to paid UPS or USPS expedited service. Although expedited shipping costs more, it'll be worth it if you need the pair ASAP. Support options are usually by phone, email and live chat. FAQ and help sections should address most issues. Some websites even have an active social media presence, and one site prefers using WhatsApp to provide the quickest answers! If you have a medical question that’s not adequately addressed by online support, please make an appointment with your optometrist or ophthalmologist. They are better equipped to handle your concern, after all.